EASyM offers a reduced membership fee for individuals who are 30 years, or younger, still in training or work as junior doctor/postdoc. Individuals who belong to an institutional member of EASyM share the same benefits as individual members of EASyM. Especially for larger organisations this option may thus be advantageous. 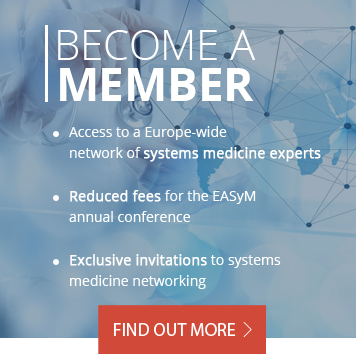 In addition, institutional members have the right to have any of their public communications and other public output that is related to or relevant for the advancement of Systems Medicine (expect for advertisement for their products and services) distributed to all EASyM members and displayed on the EASyM website. Please note that only legal entities can apply for institutional membership. Research institutes who are part of a university or other larger entity can informally apply for the status of Associate of EASyM. Please note that recognition as an associate denotes an informal partnership and does not grant EASyM membership rights.